My husband gets obsessed easily. For months, he’s been incessantly researching the next car he should buy — in 2015. He often contemplates where we should own a second home if we ever win the Lotto — even though we haven’t bought a ticket in four years. And of course, with the nickname of Meat Boy, he is rather single-minded when it comes to meat, as in the more, the better. As you know, it’s a ceramic cooker that can grill and smoke foods. It also weighs 10,000 pounds. I exaggerate — but barely. This behemoth looks like a cross between a giant landmine and a prehistoric egg. And since he bought it a few months ago, he’s been experimenting with it every weekend, turning out pizzas, turkey burgers, leg of lamb, charred eggplant, steaks and the like from it. The latest thing to hatch from this egg? 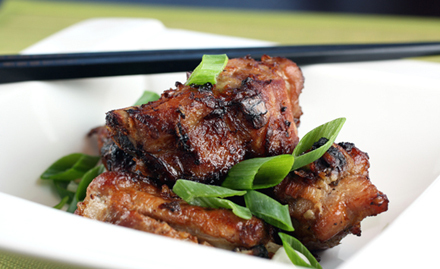 Tender, meaty Asian ribs so good that he’s already thinking of making them again. The recipe for “Ginger, Garlic, and Honey Grilled Baby Back Ribs” is from the new “Planet Barbecue” book (Workman Publishing), of which I recently received a review copy. It’s the latest book by grill-meister Steve Raichlen, whose other grilling books have sold more than 4 million copies. Raichlen’s latest book boasts 300 recipes from 60 countries — all done on the grill. This particular dish is from Sarun Pich, chef and culinary instructor at the Amansara resort in Siem Reap, Cambodia. Unlike American-style ribs that slow roast for hours on end, Raichlen writes, these Cambodian-style ribs get their flavor not from smoke but from a marinade, as Asians, for the most part, don’t have the luxury of cords and cords of wood to cook with. These baby backs get marinated for up to four hours in a paste of garlic, ginger, honey, soy sauce, fish sauce, salt and sugar. The ribs are grilled for only 8 to 12 minutes per side. Then, an easy-as-can-be dipping sauce of salt, white pepper and freshly squeezed lime juice is stirred together to use at the table to help cut the fatty richness of the meat. The results are tender ribs, made to eat with your fingers, with sweet caramelization that get a last-second, wake-me-up blast of citrus tang and tingling pepper. In another month, my husband will probably find something else to preoccupy himself with every waking moment. 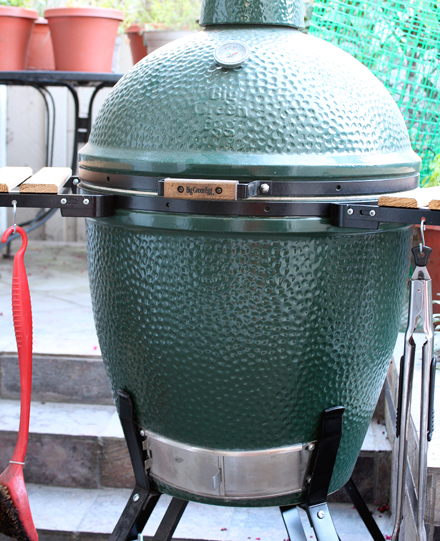 But for now, thankfully, it’s the Big Green Egg, which is turning out to be one deliriously delicious fixation. 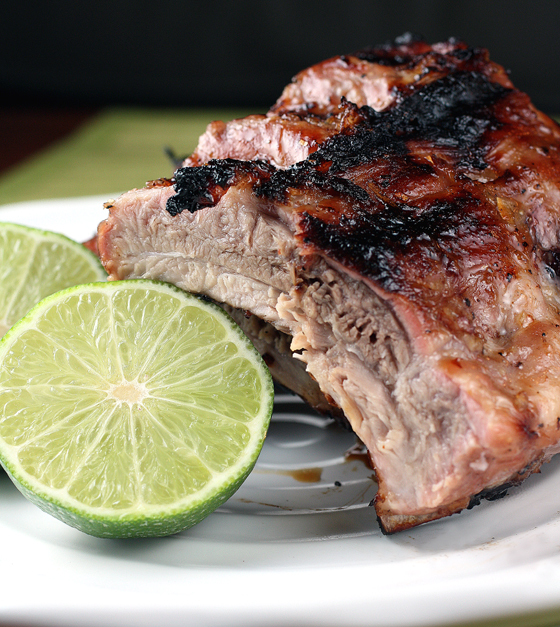 Prepare ribs and spice paste: If necessary, remove the thin, papery membrane from the back of each rack of ribs. If you are using the larger racks of ribs, cut each rack in half. Place ribs in a nonreactive baking dish just large enough to hold them in a single layer. Place garlic, ginger, sugar, 1 tablespoon of salt, and the black pepper in a mortar and pound to a paste with a pestle. If you do not have a mortar and pestle, puree these ingredients in a food processor. Work in the honey, soy sauce, and fish sauce. Spread spice paste over baby back ribs on both sides. Let the ribs marinate in the refrigerator, covered for 1 to 4 hours; the longer the ribs marinate, the richer the flavor will be. Prepare ingredients for dipping sauce: Place 1 teaspoon of salt and 1 teaspoon of white pepper in neat mounds side by side in each of 4 tiny bowls for the dipping sauce. Place 2 lime halves next to each bowl. When ready to cook, brush and oil grill grate. Place ribs, bone side down, on the hot grate and grill until golden brown and cooked through, 8 to 12 minutes per side, a little longer for full-size ribs. Watch for flare-ups. Should they occur, move ribs to another section of the grill. When ribs are done, the meat will have shrunk back from the ends of the bones by about 1/4 inch. Transfer racks of ribs to a cutting board and cut them into individual ribs, then arrange them on a platter or plates for serving. Just before eating, instruct your guests to squeeze 1 to 2 tablespoons of lime juice into their bowls of salt and pepper and stir them with chopsticks until mixed. Dip the ribs in the sauce before eating.